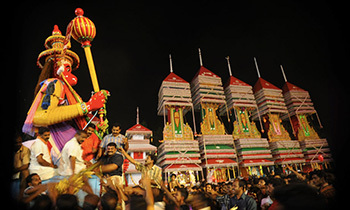 Chettikulangara Kettukazhcha, conducted every year on the Bharani Nakshathram of Malayalam month ‘Kumbham - It is probably the most amazing cultural visual spectacle in Kerala, similar to the Thrissur Pooram. The event is an offering of the people of Chettikulangara to their beloved deity known for her spontaneous blessings on true devotees as a mark of gratitude, devotion, unflinching faith, and for showering prosperity and protection to their lives. ‘Kettukazhcha’ displays deftly sculpted and decorated forms of ‘ six temple cars known as ‘Kuthiras’, five Therus’ (Chariots ) and icons of Bhima and Hanuman. All the temple cars, chariots and the icons are all incredibly gigantic in size and are many times larger than any other similar Kuthiras and Therus built during the festivities at other temples in the Central Travancore region. On the move, these out of the world sky scrapping colourful decorations are electrifying, and will create an unforgettable artistic impression in union, especially during the night in the back drop of illuminated lights. Chettikulangara Kettukazhcha heralds the architectural and aesthetic acumen of the ancient people of Chettikulangara, who could convert an improbable out of the world concept to an enormous artistic reality, achieved by collective hardships and will power. Kuthiras have a height of about 70 to 75 feets, and are a union of four parts– Adikkoottu, Kathirakal, Edakkodaram, Prabhada and Melkkoodaram, one above the other respectively. Adikkottu, the basic structure also known as Vandikkoottu, form the basic foundation which consists of four big wooden wheels interconnected with four other beams above it. Kuthiras have Thandu, two long huge wooden poles helpful to control the direction while on the move. Thandu and the basic structure are interconnected and have reinforced wooden bearings similar to the modern shock absorbers. The Kathirakal, with about 35 feet height, consists of four long poles interconnected with Arecanut poles known as ‘Alaku’ and reinforced with coir and Panavalli knots. These are again strengthened with ‘Kuthukathrika’ or criss cross formation of Alakus. 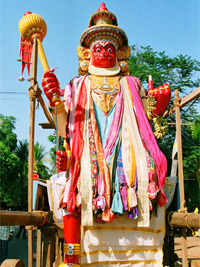 Kathirakal is again bifurcated to two parts – the lower portion consisting of four to five extended layers of Thattu and Charippu (slanting pyramid shaped boxes, made of interconnected Alakus and coir formation, then decorated with white cloth known as Vella, colourful glittering clothes and embellishments called ‘Thookku’. The above portion is reserved for Prabhada, which consists of exquisite wooden carved sculptors narrating stories from the Puranas, elephant caparisons called Nettipattoms, Thalekkettu and Aalavattom displayed in the backdrop of colourful clothes and sculptors. Many of the Prabhadas have stories like Gajendramoksham, Vasthrapaharanam,Krishnavatharm. The Edakkoodaram, almost half the size of Kathirakal with four to five Charippu made as in the lower portion, comes above the Kathirakal. It also has glittering different clothes and Vella, interlaced with colourful Thookku embellishments. Melkkoodaram, the top structure is exactly having a pyramid shape, and pivotal to it is an extended long sculpted wooden pole in white colour known as ‘Nambu’. All the separate units are pulled up and placed one above the other with the help of wooden pulleys, giant coir ropes called Vadams with a length of over 100 fts.and with huge iron structures, drawn by hundreds of people. Theru does not have the Prabhadas and Edakkoodarams. Their illithattu and charippu are larger than that of the Kuthiras and diminishes in size upwards. Therus are also relatively smaller in comparison to the Kuthiras of Erezha South, Erezha North, Kaitha South, Kaitha North and Pela. Preparations for constructing the Kettukazhchas start from Shivarathri, about six to ten days prior to Kumbhabharani. On the evening of Kumbhabharani, the Kettukazhchas are dragged to the temple by hundreds of people, and are paraded at the paddy field in front of the temple. After Bhagavathi’s Ezhunnellippu to bless the Kettukazhchas and people, the Kettukazhchas are taken back to the respective Karas by next morning. 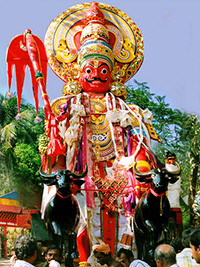 The dismantled parts of Kettukazhchas are kept at the ‘Kuthirappura’ of each Karas. Historians attribute the concept of ‘Kettukazhchas’ - similar to the architecture of the ‘Buddha tradition in square, rectangular and pyramid shapes, to the remnants of the Buddha culture which was widely prevalent in the Central Travancore region a few centuries ago.